What is happening as the story opens? Way Way, a young Burmese woman, is admiring the elegant Western-style furnishings of the neighbouring house. The house belongs to her brother, but has been vacated to make way for an English rice buyer. Although Way Way is proud of her home and her culture, she suddenly feels inferior, and feels inspired to make changes in her life, such as buying a new set of furniture and deploying a tablecloth, to mimic what she sees as more elegant Western ways. Way Way is the main character. She is seventeen years old. She dropped out of high school to take care of her ailing father and manage the family’s rice business. Her dutiful attitude throughout the events of the novel is likely to frustrate contemporary feminists. U Saw Han is the name of Way Way’s new neighbour, the Westernised Burmese rice buyer. He admires and pities Way Way. He falls in love with her. After they marry, he tries to give her a better life. U Po Thein is Way Way’s father. He misses his wife, who left the family to become a Buddhist nun in the Sagaing hills near Mandalay. Ko Nay U is Way Way’s brother and a politically active Burmese nationalist who takes part in anti-imperialist protests. He disapproves of Way Way’s choice of husband. Hta Hta is Way Way’s sister, the wife of a roving doctor. She encourages Way Way to marry U Saw Han, as she believes they are in love and that marriage is appropriate for young people in love. Way Way’s family’s house is in Moulmeingyun, a town in the southwest part of the country in the Irrawaddy River delta, about 160 kilometres from the capital (Rangoon, now known as Yangon). The author grew up in this area. The intellectual political group that Way Way’s brother joins in the novel is a real historical group called the Dobama Asiayone (We Burmans Association). Members called themselves “thakins”, true “masters” of the country. When the story begins, it is 1939 and the British are in control of Burma. Towards the end of the book, the country is invaded by Japan and enters a period of chaotic transition. The Japanese bombings of Rangoon mentioned in the book took place from December 1941 to March 1942. 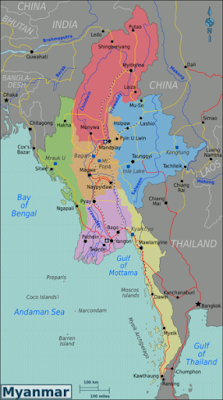 The Burmese Independence Army, with the help of the Japanese, managed to liberate the country from British rule, but the result was that in 1943 Burma became a puppet state of Japan. Although reforms have brought Myanmar into more frequent contact with outside influences, it remains one of the more mysterious countries in Southeast Asia. The story of Way Way’s life thus gives us a window into Burmese history and culture, a particularly valuable one in that it was not written to appeal to an outsider’s appetite for the exotic. We must rely on the translator’s footnotes to learn that, for example, a gaung-baung is worn on the head and resembles a turban and that thanaka paste is a widely used cosmetic paste made from sandalwood. Way Way's story gives readers a new perspective on Western culture. How would the trappings of English life appear to someone unfamiliar with them? Way Way's reactions help us imagine the strangeness of wearing shoes indoors, using cutlery instead of the hands for eating, and taking nourishment from bread and butter instead of rice and spicy fish paste. The moral of the sad story is worth noting: good intentions without good understanding portend disaster. 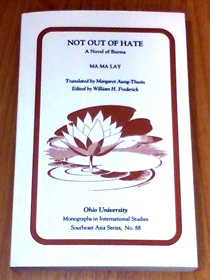 Not out of Hate is available from Ohio University Press. The February 1958 issue of The Atlantic, which is focussed on Burma, offers more on twentieth-century Burmese literature and an explanation of Burmese personal names.